One of the questions I get the most is “What photography equipment do you use?”, so today I’ll let you take a peek inside my camera bag! Even if I switched photography genre though, my equipment hasn’t changed. I’m not a very technical photographer and since I’m often on the road I prefer to keep my photography gear to the minimum necessary. I believe equipment is an important part of photography but it’s not what makes a photographer great. Your eye, the way you see the world and shooting with your heart are the factors that will shape you as a photographer, not your gear! –Canon 5d mark ii (yes, I know, I’m due for an upgrade!) I love this camera and has served me well over the years. It’s not ideal for low light situations unfortunately but I only shoot with natural light. –Canon 85mm f/1.2 this lens is my baby, I love everything about it! I use it mainly for portraits. 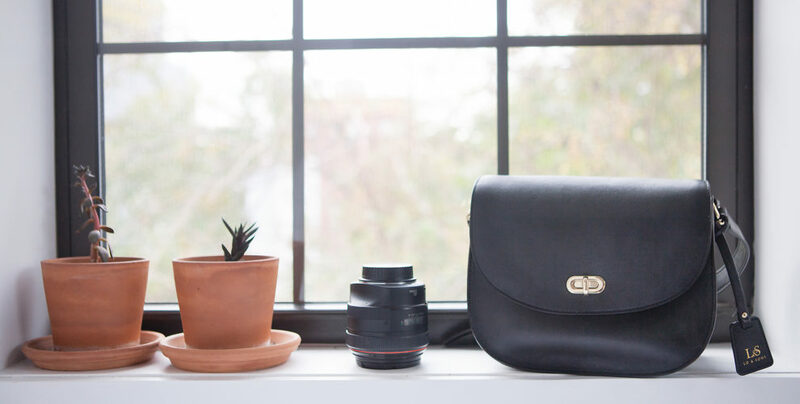 –Lo&Son Claremont bag This is the perfect camera bag for girls who travel (sorry boys,I have no tips on man camera bags but Lo&Son makes some great backpacks and carryon bags!). It’s chic and stylish and doesn’t look like a camera bag at all. It’s padded with protection inside, it has two memory card pockets in the front and a zip pocket in the back perfect to put your phone and passport. I’m in love with this bag! I’m a photographer in the Chicago area. I heard your interview on WGN radio and became intrigued. You’re pretty amazing I have to say. Nice work and a lot of fortitude. I’m contemplating more travel in the future to photograph women and landscapes. Would love to possibly share some ideas with you. Maybe we could set up a Skype or FaceTime one of these days.